Thanks to Mary Kay Kare, Margaret Austin, Damien Warman, Mike Scott for caption help on this page. Simon Bradshaw with his back to the camera, Mike Scott in green, Kathy Taylor in pink and red, and Steve Davies at right with a white shirt. Tom Womack in a blue shirt with binoculars, and someone else in a yellow shirt in the second row; Dave Langford in a blue shirt in the front row; a man in a spiffy vest and Mike Scott in green. Mike Scott in green; Tom Womack in blue in the second row, Dave Langford in a blue shirt in the front row, Roger Robinson in yellow in the second row, Chris O'Shea in a dark-colored shirt sitting in the third row, John Dallman in blue standing, Sandra Bond sitting in the second row, Simon Amos sitting next to her, and Douglas Spencer at the right in the front row (obscured). Margaret Austin in the foreground left, and Pete Tyers. Various. Alison Scott at the front right in the white shirt in profile. Margaret Austin on the left, Mike Abbott with beard and long hair, and (name withheld) on the right. Fran Dowd in a blue dress. Martin Easterbrook, and Fran Dowd in a blue dress. 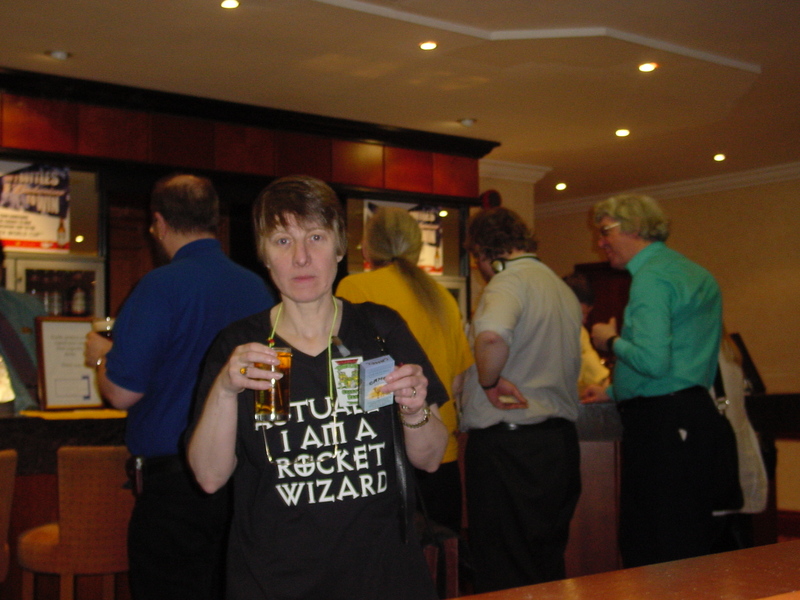 Colette Reap with her shirt that says "Actually I am a Rocket Wizard." Behind her, someone in blue, Roger Robinson in yellow, someone (possibly John Richards) in a light-colored shirt, and Langford at the far right.